Texas real estate has swallowed up many a smart businessmen, but not Alan May or Paul Zane Pilzer. Seven years ago, May and Pilzer found just what they needed to overcome that tough market. Each other. At a time when a sagging economy has driven many competitors out of business, Pilzer and May have shown an eclectic touch. They’ve consistently bought the right property in the right market at the right time. Since forming Zane May Interests in 1982, Pilzer, 35, and May, 54, have acquired office buildings, shopping centers and industrial space totaling 7.5 million square feet. Accomplished businessmen long before they met, Pilzer and May form a team that has all the ingredients to achieve unusual success. Pilzer knows how to accelerate. A whirl of energy, he travels the globe as businessman, professor, author and public policy activist. “My mission is to make sure I’m always on the cutting edge of the business world,” Pilzer says. May, meanwhile, controls the reins from day to day, managing Zane May’s 55 employees. A careful strategist, he looks at about five deals a day, but completes two a year. May’s resume has plenty of sparkle before he met Pilzer in 1981. As a student in MIT’s Sloan School, he wrote a thesis on predicting the stock market by computer. A few years later, while in night school studying for his MBA at New York University, he learned that NYU had reprinted his thesis. “I was required to read my own bachelor’s thesis to get my MBA,” he says. May was already managing $500 million of the Bankers Trust pension investment portfolio when he received his MBA. At his boss’s suggestion, he stayed clear of commodity-based equities and invested entirely in blue chips. It’s an approach he still appreciates today. After a brief stint in the Army, May returned to Bankers Trust as a loan officer in the petroleum division. The youngest loan officer in the company’s history at age 23, May used his background in engineering and his numerical ability to be one of the first cash-flow lenders of his time. May rose to assistant vice president before leaving to be vice president of finance for Elcor Corp. in Midland, Texas. He then moved to Steak & Ale Restaurants as chief financial officer, where his job was to expand the company beyond four restaurants and $3 million in annual sales. May began by buying back the company’s joint ventures in franchises to prepare for a public offering. But he found that investment bankers could not be bothered with a company so small, and they refused to take the company public. Determined to succeed, May sent those bankers a four-color annual report in which he forecast $11 million in sales for the following year. When the company met that goal, Steak & Ale was taken public in the smallest initial public offering ever done by Goldman, Sachs & Company. May led an expansion that pushed sales over $100 million in 1976. What’s more, Steak & Ale achieved the highest return on sales of any publicly owned food chain. May and his associates sold the company to Pillsbury in 1976. May did not want to move to Minneapolis, so he left to manage his own assets and consult for a number of Fortune 500 companies. Among other projects, he helped turn around the W.R. Grace restaurant group, and he advised the Hunt family on several mergers and acquisitions. Pilzer, meanwhile, was doing all he could to redefine the term “wunderkind.” He got off slowly at Lehigh, posting a 1.8 grade-point average in his first semester. He then convinced officials that to stay focused he needed to take an unusually heavy workload. He took up to 10 courses a semester to earn his journalism degree in less than three years. After running his own business for one year, he enrolled at the Wharton School, where he got his MBA in 16 months at age 22. Pilzer then joined Citicorp on the personal staff of now Chairman John Reed. He was making a good living, but he wanted to try something on his own. That summer, Pilzer rented a house in Westhampton, kept one room for himself, and rented the others. He took in enough cash to pay for his room and pocket $1,000. Soon he was building several beach homes. He’d work all day in the city, hop a train to Westhampton to supervise construction, and return to work the next morning. For the next few years he owned and rented enough homes to generate a six-figure income. By day, Pilzer was carving a name as one of Citicorp’s sharpest young bankers. As a junior vice president at 25, he would consistently beat out his older rivals. “You can’t possibly hire me away from here,” Pilzer told him. In the next 45 minutes, the man said he wanted Pilzer to invest $100 million for him before the end of the year. He offered a compensation package so generous that Pilzer could not refuse. Even so, Pilzer’s decision to leave Citicorp after five years was not an easy one. Pilzer took that philosophy to Dallas to start the company that would become Zane May Interests. He soon found that many Texans shared his view of the world. In 1981, Pilzer and May were introduced by investor Sid Bass. They worked together on the syndication of an office building in Tulsa in 1982 and became partners later that year. Their core strategy is to buy income-producing property for less than 50 percent of what it would cost to build the same property. May and Pilzer make the most of their time away from the business. May has collected art ever since he paid $2 for a Manet print on his honeymoon. Today his Dallas home could pass for an art gallery. 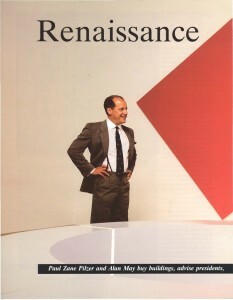 His affiliations in the art world range from New York’s Metropolitan Museum of Art to the Boston Museum of Fine Arts. Thirty times a year, May travels to New York to take courses in Egyptian art history at NYU’s Institute of Fine Art. His library holds a striking display of Egyptian artifacts. On one pedestal sits the Divine Head of Anna, which dates to 700 B.C. It was discovered in 1896 by the Archbishop of Canterbury’s daughter, the first woman legally to excavate in Egypt. May’s library holds 1,800 books on Egyptology. Pilzer, too, still has a link to Manhattan. For 10 years he has been an adjunct professor of finance at NYU, flying to campus once a week in the fall to teach graduate and undergraduate courses. Pilzer is also an accomplished author. His first book, “Other People’s Money,” addresses the savings-and-loan crisis and is being published by Simon & Schuster this fall. Pilzer does much of his writing at his Utah home, where he spends his winters. Pilzer has advised members of the Reagan and Bush administrations. He says a long-range goal is to be appointed secretary of education or chairman of the Federal Reserve. For now, though, Paul Zane Pilzer and Alan May work together to make their real estate work harder. To this day the two men have not signed a formal partnership agreement.